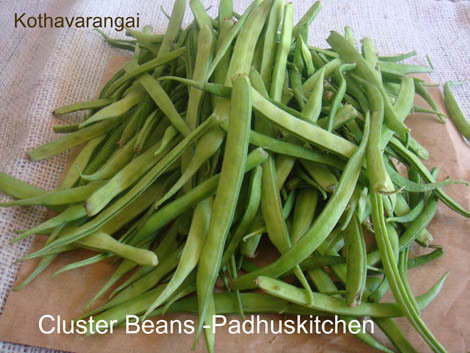 Cluster Beans or Guvar beans is known as "kothavarai" or "kothavarangai" in Tamil, "gawaar" in Hindi and "gokarakaya" in Telugu. I harvested a kilogram of cluster beans from my organic kitchen garden a few days back. Unlike the ones you get in the market, these are very soft and tender. 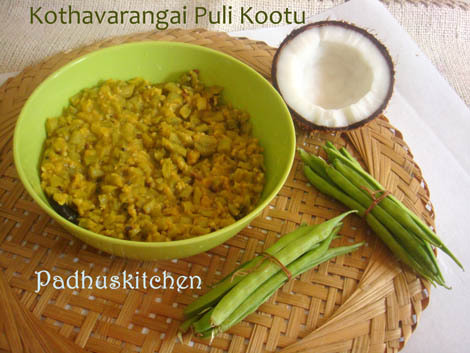 Today I am going to share with you how to make kothavarangai puli kootu (using tamarind) following this easy recipe which does not require any grinding of masala etc. Soak dal in hot water for 15 minutes and pressure cook for 3 whistles, adding a pinch of turmeric powder. Mash it well and keep it aside. (Soaking ensures faster cooking). Soak tamarind in warm water for 15-20 minutes and extract its juice. Discard the pulp. Soak brown chick peas (brown channa) in water overnight and pressure cook for 3 whistles or until soft. You can cook this along with dal, keeping it in a small bowl. Adding chick peas is optional but I recommend it. Cut off both the ends of cluster beans and chop it into small pieces. Fry grated coconut in a tsp of oil till it changes color and keep it aside. Mix rice flour in 2 tbsp of water and keep it ready (rice flour is added for thickening the gravy). Heat a tsp of oil, add mustard seeds, when it splutters, add red chillies, curry leaves and chopped cluster beans. Add turmeric powder and salt needed. Add 1/4 cup of water and cook until the cluster beans becomes tender, stirring from time to time. Alternatively you can also pressure cook cluster beans for 1 whistle. Once it is cooked, add tamarind water, sambar powder and boil till the raw smell of the tamarind and sambar powder goes. Then add cooked tur dal, cooked brown channa, fried coconut, rice flour mixture and boil everything together until it thickens slightly. Check for salt. You can adjust the consistency of the kootu according to your personal preferences. Nice kootu, never tried kothavarangai like this.. I like cluster beans lot, this puli looks delicious. I usually make stirfry with them. I have not tried this kind of kootu. Mine is always without tamarind. Very interesting recipe. Once I find kothavaranga in the Indian store i will try it Padhu. thanks for sharing. very tasty and yummy kootu.. I used to prepare stir fry..this sounds very delicious...bookmarked ! Love this..
You can add fried kulambu karuvadam to the pulikootu it will increase the taste in place of black channa dall.